One of the best ways to make a daunting task fun is to turn it into a game. This gamification has been used for everything from eating your vegetables to cleaning house to doing your homework. The idea may sound silly, but it works. Nexersys has taken this concept to an entirely new level. They have taken a simple kickboxing pad and turned it into a gaming system. 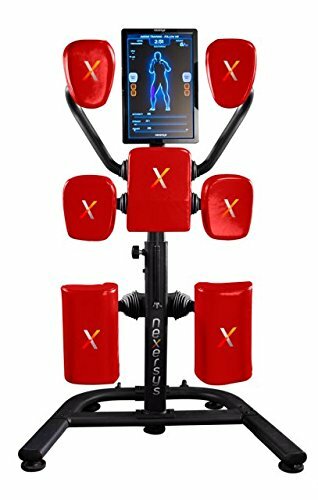 Instead of one striking pad that a partner holds, Nexersys has 7 striking pads mounted on a pole. At the top center of the pole is a 19-inch LCD flat screen monitor that guides you through a series of user-selectable workout programs. The Nexersys uses high intensity interval workouts which are shorts burst of very rigorous exercise, followed by brief resting periods. This cycle of high intensity then rest then high intensity then rest has been shown to be more beneficial than a longer workout at a lower intensity. That means you get results fast. Other types of workouts are available as well. You can select from a circuit training routine or you can test your skills by competing against a friend or going one-on-one against one of the Nexersys avatars. When in this mode, the system is like an arcade game. Strikes on a pad knock your digital opponent back and deducts from their health. Once your game is complete, your performance is evaluated and tracked over time. As your performance improves, you gain rank. Nexersys isn’t just about having fun. It gets results too. During a 12-week study, participants lost as many as 40 pounds. The Nexersys was also used on The Biggest Loser Season 16. The contestants loved it so much that Nexersys gave the three finalists one for their own home.